The glyph is formed by a semicircle (soul) on a circle (spirit). The soul’s instinctive longing for unity with spirit dominates spirit itself. The image also depicts the Full Moon joined with the Crescent Moon to indicate the amplification of the Moon’s growth and fertility principle, which is so exalted in this sign. Besides suggesting a bull’s head, the glyph also evokes the shape of an amphora with a wide opening to portray the faculty of gathering and preserving material resources. The Latin term taurus comes from the Greek tau, prototype of the letter <T> and phallic symbol representing the origin of life and its continuity. Despite its male apparent connotations, the bull’s head portrays the structure of the woman’s reproductive system and has been used since ancient times in close association with the female power of birth. The cult of the bull Apis was attested in Egypt in early times. It was the living personification of the creator god Ptah, operating as the intermediary between the god and mankind. The start of a new age was originally indicated by the destruction of the symbols of the previous age. The custom to slay a bull, typical of various ancient traditions (such as the Mithras Mysteries), was a way of representing the ending of the Age of Taurus, just as the slaying of Jesus, as the Lamb of God, marks the conclusion of the Age of Aries and the beginning of the Age of Pisces. 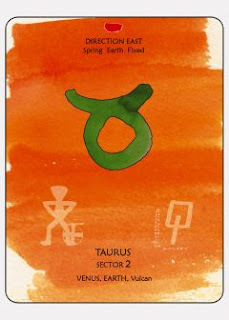 Taurus is a builder that shapes ideas into concrete form - laying foundations, employing amazing reserves of energy, and appreciating all pleasant aspects of life and the gifts from the Earth. Whereas Aries is impulsive and direct, Taurus is slow, constant and patient. The first sign of the zodiac is a pioneer that, after a harsh fight, succeeds in conquering the land and planting the seed. The second sign takes possession of what is conquered and starts to build and grow. Its spiritual challenge is that of giving its resources to a higher Intent and of being willing to connect this Intent to the Function. This path of initiation in Taurus is related to the mastering of the life force that usually expresses itself through sensuality and intimacy. It is a rather controversial area, since for ages it has been exploited and manipulated. Its keys lie in the deep understanding of physical forms and the acknowledgment of the material nature of the spaces that are humanly perceived as empty. 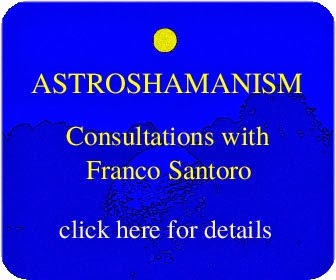 Shamanically, this involves being able to experience the related sensuality, and to receive constant intimate support from the basic energy that surrounds us. For further details on Taurus click here.